Vietnamese Prime Minister Nguyen Xuan Phuc has given the go-ahead to Hoa Phat's high-profile steel plant in the Dung Quat Economic Zone, newswire thanhnien.vn reported. A letter signed by Deputy Prime Minister Trinh Dinh Dung said the PM agreed with the overall direction of the steel project in the economic zone located in the central Quang Ngai province. The letter instructed the various related ministries to assess and oversee the investment, technology and environmental impact of the project, in conjunction with Quang Ngai province People's Committee. As previously reported by VIR, Hoa Phat Group, among the country's largest steel producers, proposed last October to resume the construction of the Guang Lian steel plant in the Dung Quat Economic Zone, which had its investment certificate revoked in September due to long delay in construction. Accordingly, the new project will have a total investment capital of $3 billion and an annual capacity of four million tonnes. It will be built in two phases, with a capacity of two million tonnes each. 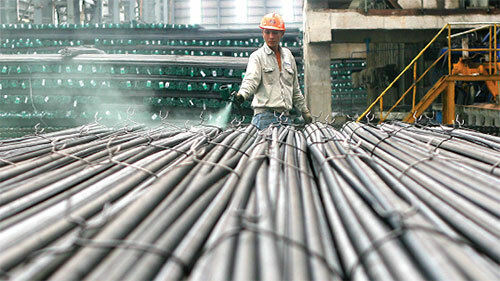 According to the Dung Quat Economic Zone Management Authority, the steel plant with an annual expected revenue of $2 billion will not only contribute about VND4 trillion ($178.3 million) a year to the province's budget, but also create about 8,000 jobs. The approval of Hoa Phat's project comes after a 2016 year of intense public debate over environmental consequences of large steel plant. In April, a toxic waste spill from Formosa's $10.5-billion steel complex in the central Ha Tinh province caused mass fish death along the coast of four central provinces. In August, the government approval of Hoa Sen Group's $10.6 billion steel plant, which would be the largest in Vietnam, was met with widespread concerns over its environmental impact.